TheGunBlog.ca — Two leaders of Canada’s firearm community, TheGunBlog.ca and the Canadian Shooting Sports Association, joined forces on a new book to help gun owners, policymakers and journalists understand how Bill C-71, the government’s first proposed firearm legislation in a generation, aims at the wrong target. The Bill C-71 Book: What It Means, How It Hurts You, and 3 Easy Steps You Can Take Right Now to Block It is the most comprehensive and easy-to-read overview of the draft law. The free 96-page PDF e-book is a joint project of TheGunBlog.ca, Canada’s leading source of news on gun politics and the firearm industry, and the Canadian Shooting Sports Association, the country’s leading gun-rights advocacy group. The Bill C-71 Book represents a significant milestone in the history of Canada’s firearm community. It marks the first time in the country’s history that a book is published on a draft gun law. It’s also the first major collaboration between the two groups. The authors are critical of the planned law and urge gun owners to oppose it by engaging with members of parliament to express their concerns. The Minister of Public Safety’s bill is directed at federally licensed hunters, farmers and sport shooters who have taken and passed RCMP-approved safety courses and background checks, and are monitored daily by the Royal Canadian Mounted Police. This legislation would impose new restrictions on more than 2 million of Canada’s most scrutinized, most vetted and most responsible men and women. Download the free PDF below (2 MB). It’s also available as a paperback and on Kindle from Amazon.ca through TheGunBlog.ca Store. More resources and formats at StopC71.com. 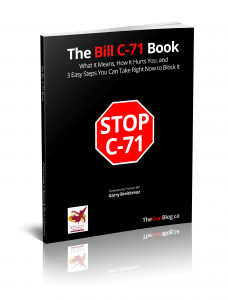 Enter your e-mail in the box below to instantly download The Bill C-71 Book. Why are we asking for your e-mail? So you get book updates, corrections or other major news on Bill C-71.